Conductors are used for a variety of purposes in hybrid microcircuits. In addition to the usual function of interconnects, they also form terminals and electrodes. 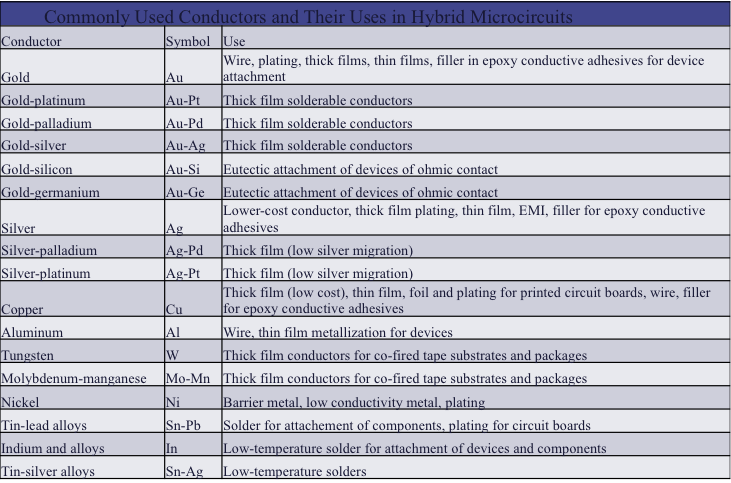 The table in Figure 8 lists some of the more commonly-used conductors in hybrid microcircuits. Adhesives also play a big role in hybrid microcircuit assembly. There are two basic types of adhesives: thermoplastic and thermosetting. These terms are discussed in more detail elsewhere on this site. Adhesives can be cured with heat, light, microwave energy, and even moisture. 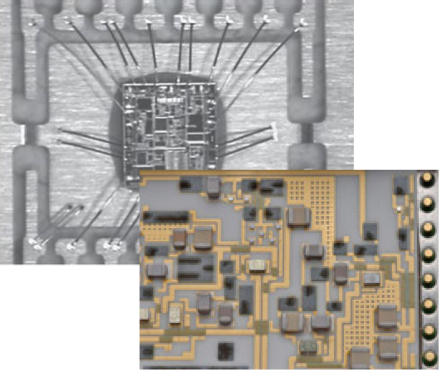 In hybrid microcircuits, adhesives can serve one or more purposes such as mechanical attachment, electrical connection, assistance in the removal of heat, and as a buffer layer to absorb stress. They are typically used for die, substrate or lid attachment, or surface mounting. Adhesives usually come as a pre-form, or a shape that is specially formed to be the size of the area required (Figure 9). Hybrid microcircuit packages (Figure 10) can be used in systems in an unencapsulated or encapsulated manner. In an unencapsulated system (a), the components and the surface of the substrate are exposed. This solution is fine if the microcircuit will be used in a protected, controlled environment. One can protect the hybrid with a polymer (b). This can be useful for mechanical protection from dust or foreign objects, but it doesn’t protect against moisture or corrosive environments. For more robust environmental protection and for use in a wider temperature environment, ceramic (c) or metal (d) packages are more appropriate. These packages can also be made hermetic, to seal out moisture and other contaminants. The last item to discuss in relation to hybrid microcircuit packaging is die attach. A common die attach material is gold-silicon eutectic (Figure 11-a). It provides a stable mechanical and electrical connection that works at high temperatures. Silver-filled epoxy is the most common die attach method. It is low cost and easy to process, but it does have some reliability issues like poor electrical connectivity. Silver-glass adhesives are a potential substitute for gold-silicon eutectic, as they have high thermal conductivity and a coefficient of thermal expansion (CTE) close to that of silicon. A fourth die attach material is solder. Solders provide better thermal conductivity. The first three alloys listed in the table (b) are the most widely used in die attach. Sn5Pb85Sb10 is used for the second of two steps in soldering operations, where one of the first three alloys is used in a first step. By controlling the reflow profile, the first solder joint is not disrupted. No completely satisfactory nontoxic lead-free alloy is available at this time to fill the roles of the first three alloys listed in the table. Au80Sn20 would be useful, but is prohibitively expensive. Others--such as Sn95Sb5--are just slightly too low in liquidus temperature. In any case, high-Sn alloys tend to be brittle, exhibit poor thermal cycling behavior and are susceptible to the Kirkendall effect in devices operating at elevated temperature. Bismuth is available and inexpensive but is the least metallic of all the metals. It offers relatively poor ductility and thermal and electrical conductivity. It is questionable whether Bi/Ag alloys will find wide application, despite having a suitable liquidus temperature. In conclusion, we briefly discussed hybrid microcircuit packaging. 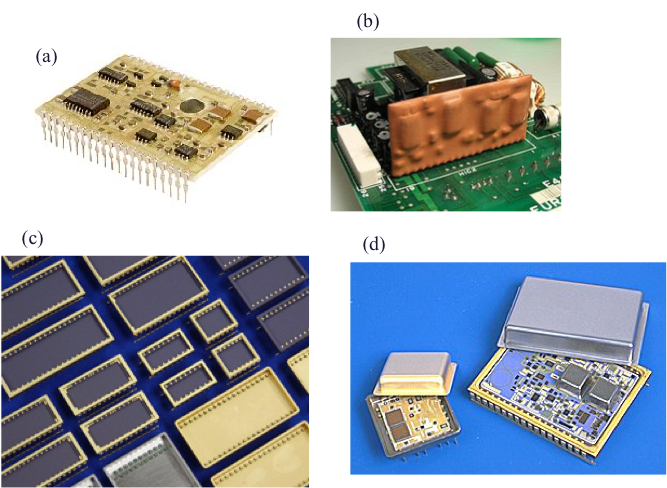 There are several elements that comprise a hybrid microcircuit beyond the semiconductor devices. They include the thick and thin film materials used on the substrate, the substrate itself, the resistors, capacitors, adhesive materials to bond the substrate to the package, the passive elements to the substrate, and the lid seal. We also covered the packages themselves as well as the die attach material. Hybrid microcircuits are likely to be used for some time into the future as they fulfill an important niche in high-reliability electronics. An extension of the ANOVA method is to use the process to examine an experimental design with blocking. Blocks might represent different batches of wafers, or a product run through different factories, or material run over different periods of time in the same factory. 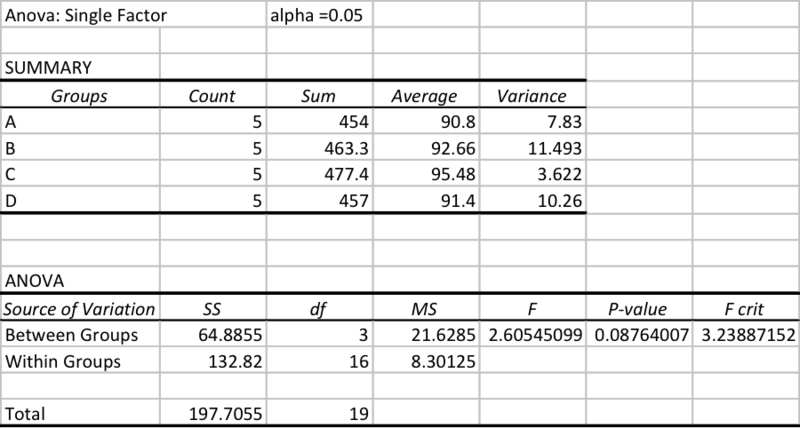 In a blocked design the idea is to quantify the effect of the different treatments, or methods, and the blocking scheme. In a randomized block design, the setup will eliminate variations between the batches. One can then test if the methods are effective by checking to see if the means are equal. One can also look at the residuals, or what remains after the grand average, methods and block effects are taken into account. Put another way, one can use residuals to identify relationships between the means and the variances. Probably the best way to understand this is to show an example. Let’s assume that we have 5 batches of a new chip design that we plan to run through 4 factories, to comply with multi-sourcing requirements for our customer. We’ll refer to these factories as Factory A, Factory B, Factory C, and Factory D. We then look at the yield associated with those factories and group them in the table like we show here. We then generate averages associated with the Blocks (or batches in this case) and the Treatments or Methods (the factories in this case). Those averages are also shown here in this table. 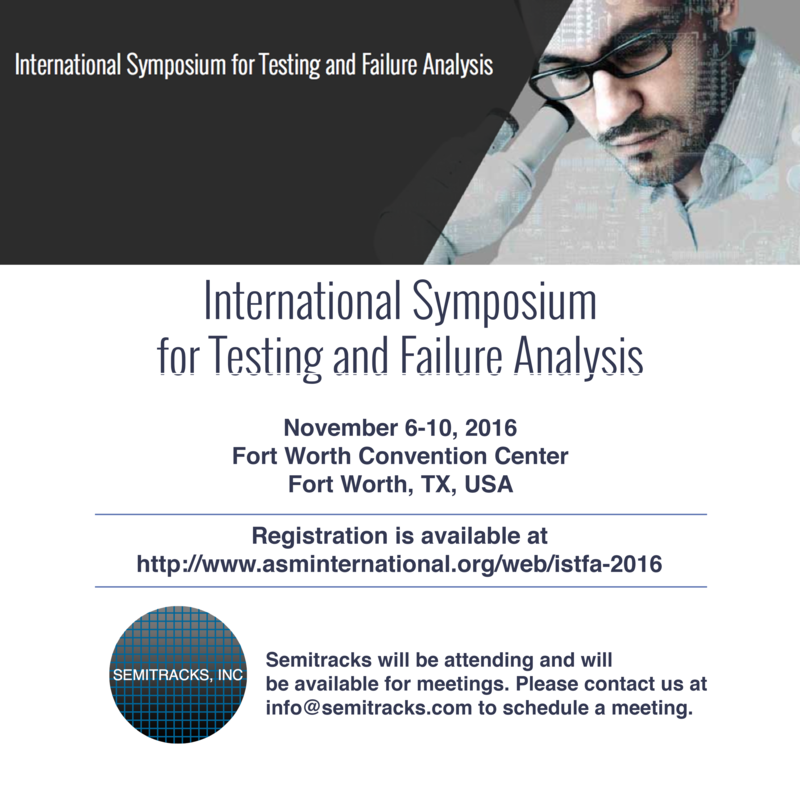 We then perform an ANOVA single factor analysis. We use an alpha value of 0.05, which corresponds to a 95% confidence level in our F-distribution. This analysis yields the results shown here on this slide. Notice that our F statistic, or F-ratio, is 2.605. This value is less than F-crit, which for 19 degrees of freedom (the sum of the between groups and the within groups degrees of freedom) and an alpha value of 0.05, is 3.24. This implies that the null hypothesis is true, or in this case, the yields are not statistically different, which would further imply that our four factories are manufacturing essentially identical product. Furthermore, since the P-value is greater than 0.05, that further confirms that our four factories are manufacturing essentially identical product. In the ANOVA data, we assumed a single factor, or that our batches were identical. Now let’s assume that the batches are actually wafers from different suppliers we intend to use. In order to account for this additional variable, we perform a two-factor ANOVA without replication. We do it without replication since there is just one value we’re examining, the yield. This table shows the results. Again, notice that our F ratios are less than the F-crit values, so the implication is that the manufacturing methods are statistically the same. 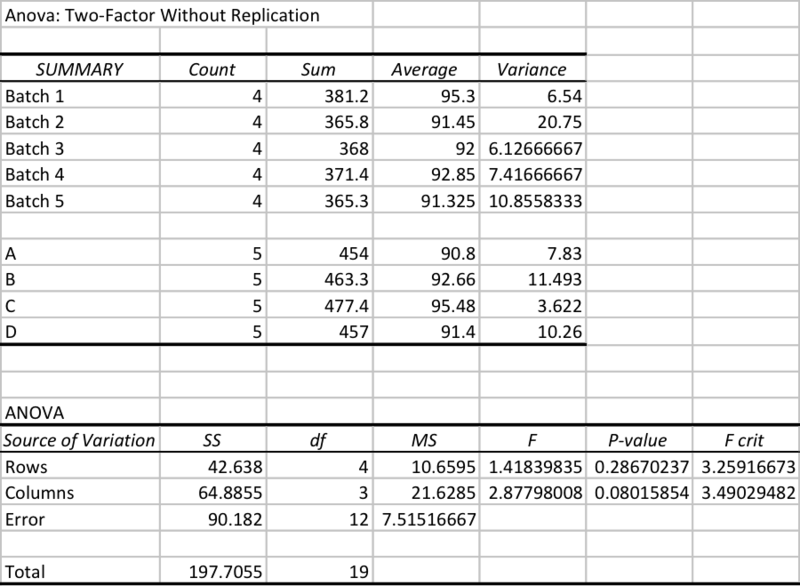 Also, notice that the p-value for the rows is much greater than 0.05. It is important though, not to read too much into this. The p-value is not the probability that the null hypothesis is true, or the probability that the alternative hypothesis is false. The p-value is not the probability that the observed effects were produced by random chance alone. The 0.05 significance level is merely a convention. The p-value does not indicate the size or importance of the observed effect. In the absence of other evidence, the information provided by a p-value is limited. Q: Does a Defect Density of 3 defects/cm2 mean that a chip that is 1cm2 will not yield (i.e., the yield will be zero)? A: No that is not true. Defects are typically randomly dispersed, so a defect density of 3 defects/cm2 is the average. There will be 1cm2 areas with 2, 1, or even no defects, and other 1cm2 areas with more than 3 defects. So there will be some yield. It will not be very large, but there will be some yield.